The Nammor Hookah Hose is a 72" fully washable hookah hose made from a thick, yet flexible material that puts out huge clouds and is very easy to clean. These hoses are just amazing! There is nothing like it on the market. The inner lining of the hose is made of a "thick-yet-flexible" garden hose quality type material, making it extremely easy to clean and will last you an untold amount of time. The diameter and thickness of the hose is the largest around allowing for great air flow and thick smooth smoke. The hose handle features a detachable mouthpiece making it easy to "sit-n-lounge." 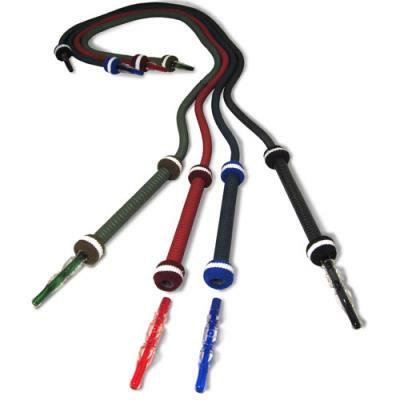 The length of the Nammor hose measures 72 inches in length with a 12 inch handle. The handle of the hose is detachable so you can easily clean and wash your hose from the inside. For best results just clean after each use and use warm water. Try using baking soda and lemon juice to keep your hose flavor free!